Teaching about Martin Luther King Jr.
Now let us begin. Now let us rededicate ourselves to the long and bitter, but beautiful, struggle for a new world. Many of the resources below are featured on the Zinn Education Project website. Teaching activity based on the text of a speech by Martin Luther King Jr. about the Vietnam War. An Analysis of Representations of Martin Luther King Jr.
A critique of the traditional textbook representations of Dr. Martin Luther King Jr. Through examining FBI documents, students learn the scope of the FBI’s COINTELPRO campaign to spy on, infiltrate, discredit, and disrupt all corners of the Black Freedom Movement. A non-academic, popular historiography that challenges educators to revamp curriculum to include a fuller, more critical history of the Civil Rights era. Charles E. Cobb Jr. discusses the Civil Rights Movement and its lessons, and how they apply to current movements. 2017. Documentary film from California Newsreel on the African American sanitation workers’ 1968 fight for human dignity and a living wage in Memphis, where Dr. Martin Luther King gave his final speech. Two segments of Eyes on the Prize II, “Two Societies (1965-68)” and “The Promised Land (1967-68),” introduce students to King’s work on housing segregation in Chicago, the Vietnam War, the Poor People’s Campaign, and the Memphis sanitation workers’ strike. 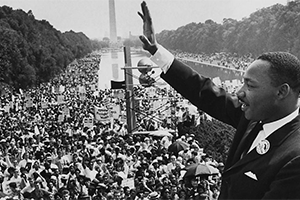 This lesson invites students to step into the long history of the freedom struggle in Selma, introducing them to people, turning points, and issues. Q: The struggle to make Martin Luther King Jr.’s birthday a federal holiday took how many years? Take our Civil Rights Movement Mythbusters Quiz to find out the answer to this question and more. Q: How long did it take Black residents of Montgomery to begin mobilizing for the Montgomery Bus Boycott? Take our Montgomery Bus Boycott Mythbusters Quiz to find out the answer to this question and more.